This merchandiser is perfect for any buffet, party, or catering event. It can be used to display just about any items from chips and snacks, to pastries and breakfast items. 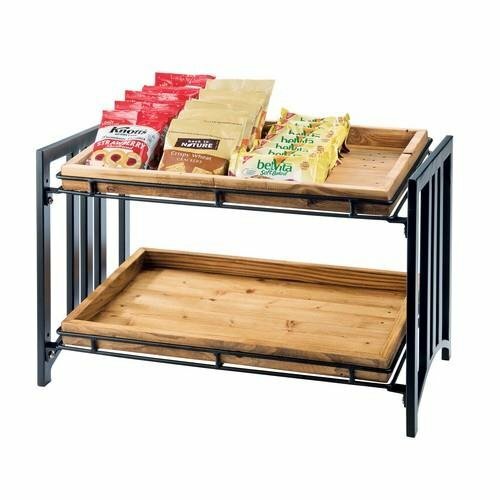 Its distinct Mission design features a prominent, sturdy black steel frame with subtle arching along the sides adds visual appeal, while adjustable slanted shelves give you additional flexibility. This merchandiser is sure to be a convenient addition to your breakfast bar, cafe, or small convenience store, and your customers are sure to love how easy it will be for them to pick out their favorite snacks without having to wait for attendant service.